"Terrific lunchtime or picnic salad, hearty enough to be a meal!" Fill a pot with lightly-salted water and bring to a boil. Cook the chicken breast in the boiling water until no longer pink in the center and the juices run clear, about 10 minutes. An instant-read thermometer inserted into the center of the chicken breast should read at least 165 degrees F (74 degrees C). Cut the breast into cubes and spread in a single layer on a plate; place chicken in refrigerator for 1 hour, or until completely cooled. Fill a pot with lightly-salted water and bring to a boil. Stir the pasta into the boiling water; cook until the pasta has cooked through, but is still firm to the bite, about 8 minutes. Drain, and rinse thoroughly with cold water to cool. Stir the celery, Parmesan cheese, green onions, mayonnaise, sour cream, milk, parsley, basil, and thyme together in a large bowl. 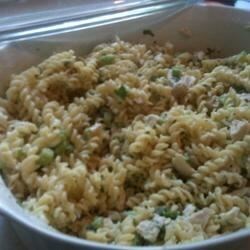 Fold the chicken, rotini, and peas into the mayonnaise mixture. Season with salt and pepper. Chill in refrigerator for 1 hour. Any leftover cooked chicken meat can be used and any method of cooking the chicken works too, saute, baked, grilled, etc. My son said It was good not great-I agree. It was simple to make but was bland- I added extra everything for more flavor. Don't think I will make again. I sauteed diced zucchini & shredded carrots for about 4 minutes, and let them cool and added them to the mix. Very good.